Diana is a consultant and project manager at StratX. She’s responsible for the design, delivery and facilitation of StratX learning and development programs. Diana’s most memorable initiative at StratX to date is co-running a women’s leadership program for a notable health and life-science’s firm. 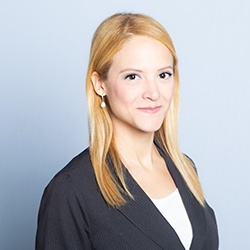 With 12 years of experience leading international projects, Diana has designed and delivered effective strategies for startups, not-for-profits, the public sector, academia and Fortune 500 companies in the following areas: business strategy, strategic and digital marketing, branding, strategic communications, innovation, leadership and entrepreneurship. One of Diana’s most notable career achievements include founding her first company when she was just 22 years old – five years later, she was employing over 40 people and running projects in emerging markets in Latin America. Since then, Diana has co-founded several companies, including a marketing and communications agency and a telecommunications startup. Within StratX Diana is known for being versatile, energetic and diplomatic. Her curious nature and motivation for learning helps to inspire new ideas for the people she works with. Diana has devoted a considerable amount of time to charity projects across Latin America as well as the US. When Diana isn’t pursuing her love for travel or practising yoga, Diana can be found enjoying outdoor activities or a glass of wine with a good book. Walking into the StratX Paris office every morning, Diana is pleased to see her favorite building: the Palais Garnier opera house.